Hastings United’s footballers are set to embark on a run of 12 games in 38 days. The U’s have three matches scheduled for the remainder of February and nine in March, including a Thursday night trip to Hythe Town. The U’s are four points and four places outside the Ryman Football League Division One South play-off spots, albeit with four games in hand. Next up is a home fixture against Tooting & Mitcham United today (Saturday, kick-off 3pm) followed by a trip to Three Bridges on Tuesday night. Billy Medlock is banned for both matches, but Sam Cole should be fit despite missing training on Tuesday as United seek to build on last weekend’s 4-2 victory at Walton & Hersham. United have secured the services of goalkeeper Harry Girling for another month. The 18-year-old joined the U’s last month on a 28-day loan from League One club Millwall, averting something of a goalkeeping crisis at The Pilot Field. 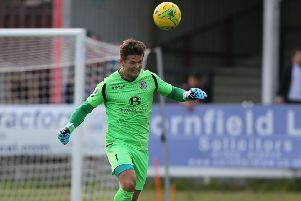 Girling kept a clean sheet on his debut against Guernsey - when he became the fourth different stopper United had used in as many matches - and has helped United pick up seven points in his four appearances so far.